RoadRunner Towing and Recovery was founded by James Smart who in 1969 began working with one tow truck. James’s skill in towing, hauling and recovery, his ability to build relationships, and his dedication to providing excellent service enabled him to build his fleet from one tow truck to fifteen. 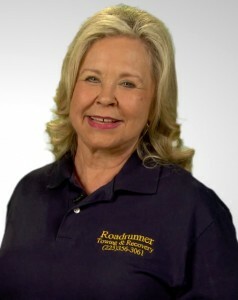 Upon his death in 2001, James’ wife Judy M. Smart moved into a full time leadership role and today, under her leadership, Roadrunner Towing and Recovery continues to serve the towing, hauling and recovery needs of Baton Rouge, Louisiana and surrounding states. We’re a family owned towing company and when you call RoadRunner Towing and Recovery of Baton Rouge, you become part of our family. You can always expect friendly service from us, no matter when you call or where you’re calling from. Remember, we don’t want an arm & a leg, we just want your TOWS! Customer satisfaction is our top priority. Our goal is to deliver quality towing, hauling and recovery services that will exceed our customer’s expectations. It is our duty to provide fast, friendly, and reliable service for people using only the latest in towing technology as well as knowing our way around the Baton Rouge metro area so we can respond quickly to your emergency needs. For immediate service call us 24/7!